On Friday, April 30, 2010, UraniumFree Virginia and L.I.F.E. volunteers will be attending the Smith Mountain Lake 2010 Business Expo. We will be distributing informational brochures and flyers to educate the Smith Mountain Lake residents, businesses, and visitors, of the risks and dangers associated with uranium mining. 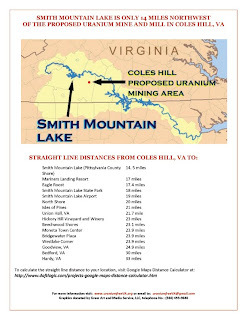 The Smith Mountain Lake, also known as the jewel of Virginia, is located only 14.5 miles Northwest of the proposed uranium mine in Coles Hill, VA. The close proximity of the mine to the Smith Mountain Lake may have negative repercussions for the area's businesses and real estate values. We believe that people should be made aware of the pending plans to mine uranium in their backyard. Our volunteers will also be collecting signatures for the petition to the Coal and Energy Commission's Uranium Mining Subcommittee requesting the Subcommittee to include the Smith Mountain Lake area in the study of socio-economic impacts of uranium mining. The socio-economic study process has already begun. The Tobacco Indemnification and Community Revitalization Commission will provide $200,000 to fund the study. The Uranium Mining Subcommittee Chairman Ware has announced that he plans to conduct a public meeting on the scope of the study in the nearest future. We believe that the socio-economic study should include the areas located in close proximity to the proposed uranium mining site, including the Smith Mountain Lake, Leesville Lake and surrounding counties (Campbell, Bedford, Franklin, and Pittsylvania).